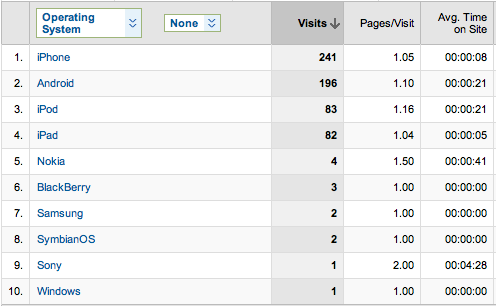 But overall most of my daily visits ( currently about 1300 ) are coming from other places. Need to work on that.. This entry was posted on Tuesday, April 5th, 2011 at 18:16	and is filed under android, ipad, iphone, mobile, nokia. You can follow any comments to this entry through the RSS 2.0 feed. You can leave a comment, or trackback from your own site.